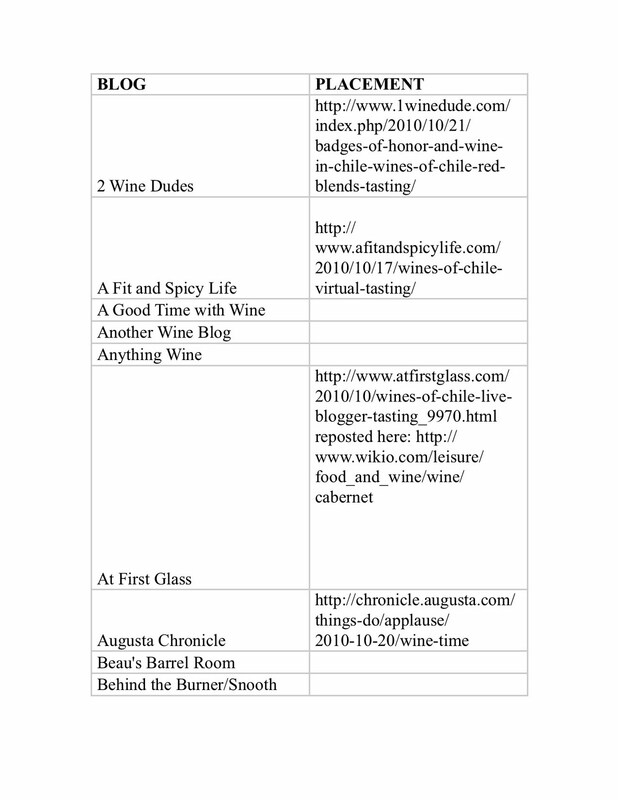 A few weeks ago I was offered the chance to participate in a live online blogger tasting of expensive (over $30) Chilean red blends. I said yes; I'm not sure why, because I don't know if I've ever ordered a pricey Chilean red blend. Then I got busy that night and missed the event. I got to wondering how effective that campaign was, so I asked, and Wines of Chile answered. Turns out the wines were sent to 50 bloggers. I have posted the list below, unfortunately in JPG format, so they're not hot links. You'll have to seek out the blogs by their names or URLs to read the posts. I had planned to write something about these posts, but fell asleep reading them (note to these bloggers: certainly I fell asleep before getting to yours.) Most are little more than tasting notes, with many people making a connection to the Chilean miners being rescued. Is this effective marketing? Most of the big names among wine bloggers skipped it. 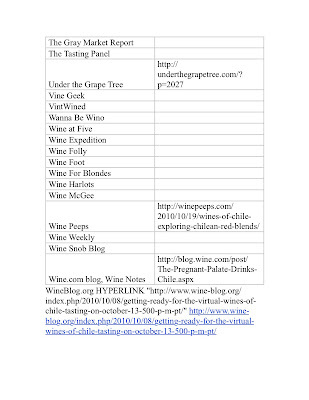 Is this enough payoff to justify the expense of shipping a box of wine to 50 bloggers -- many of whom, like me, took the wine and wrote nothing? I'd love it if people would weigh in and tell me any evidence of wines being sold because of these posts. I'd also like it if Joe Roberts or Jo Diaz or some of my other online friends who posted on the tasting would tell me if the tasting affected their opinion of Chilean wine, these wines, red blends, etc. Will you write more on the topic, or is that the end of it? I also know that I have a number of wine industry readers, so I'm curious for your take on the success or failure of this campaign. There's a reason I still allow anonymous comments on my blog, despite legal headaches (and cowardly meanies), and this is part of it. In this instance, candor may be more valuable than identity. Thanks. I dunno if this actually works, but committing to receiving wines as a part of your participation in an online tasting and then "getting busy" certainly says as much about you as it does for the relative success of these sort of outreach efforts. Yes, my application for sainthood is in serious trouble now. Social media is still relatively new so people are still figuring it out. 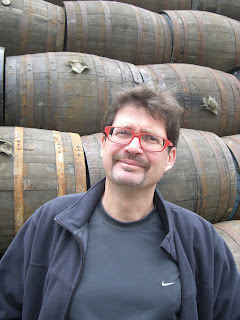 At some point wines will be sent only to writers and bloggers who have influence and followers. But if the wines aren't selling, then the only real expense is shipping and that doesn't amount to that much. Wasting money isn't new anyway. I don't know who said it, but it was said perhaps 50 years ago by a major advertiser: "I know half my advertising budget is wasted. The problem is I don't know which half." There are obviously tools that track impressions and rankings for individual blogs, but I think the benefit from this campaign is greatly enhanced by the synchronized timing of the posts. The average person might scan dozens of blogs, Tweets, emails, and radio while talking on the phone…while a single blog post may not capture one’s full attention, several posts on the same subject will certainly be noted. 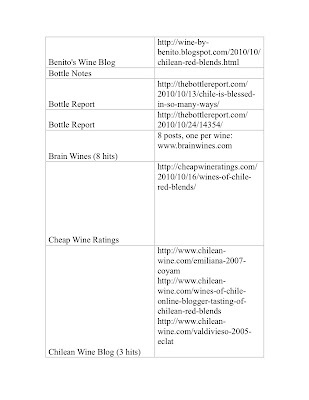 I should add that Wines of Chile said there were more than 700 tweets using #ChileBlends. Nice conversation piece. Everyone needs to understand that the metrics for measuring the "effects" of such a PR effort are NOT the same as they were when your options were to send the wines to the Parktator or nothin else. 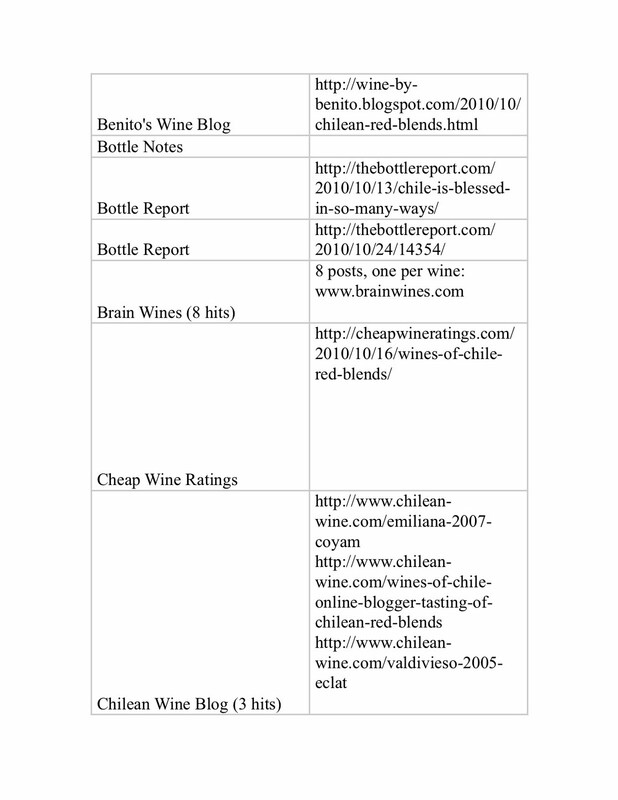 There are probably less than five wine blogs in the world whose reviews actually result in immediate wine sales. I know mine is one because wineries tell me that they sell a few cases in situations where the only way to get the wine I reviewed was to call the winery. But for the most part, immediate sales are not the measure of the effectiveness of blog reviews of a wine. 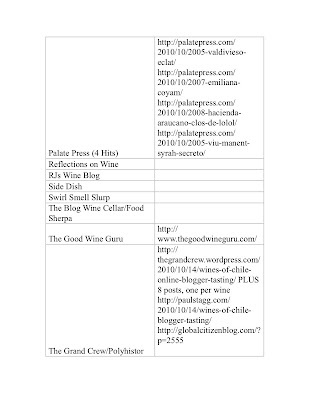 What blog reviews do is sprinkle seeds throughout the google universe so that when people are searching for a specific wine (or a specific set of keywords about a wine) these reviews show up. Google pays a LOT of attention to blog reviews (i.e. it ranks them as very relevant for any given associated keywords) and therefore, the power of blogger reviews is that when people search, they find them. Take your example at hand. Type "Hacienda Araucano Clos de Lolol review" (one of the wines sent) into google. Within the top 20 results, I think I see at least three of the bloggers in your document show up. These days, when someone wants to find out anything, the go to Google. That includes people standing in a wine store wondering whether to plunk down $$ on a $30 Chilean wine. This little stunt has likely increased the chance that in that situation, someone will find a review from one of these bloggers, and if it's positive, they're that much more likely to buy the wine. And THAT is what justifies such exercises. Seriously. He's right in that content creation to Google search is the value commensurate to sending out samples. It's reasonably cheap Search Engine Marketing and usually positive SEM at that. 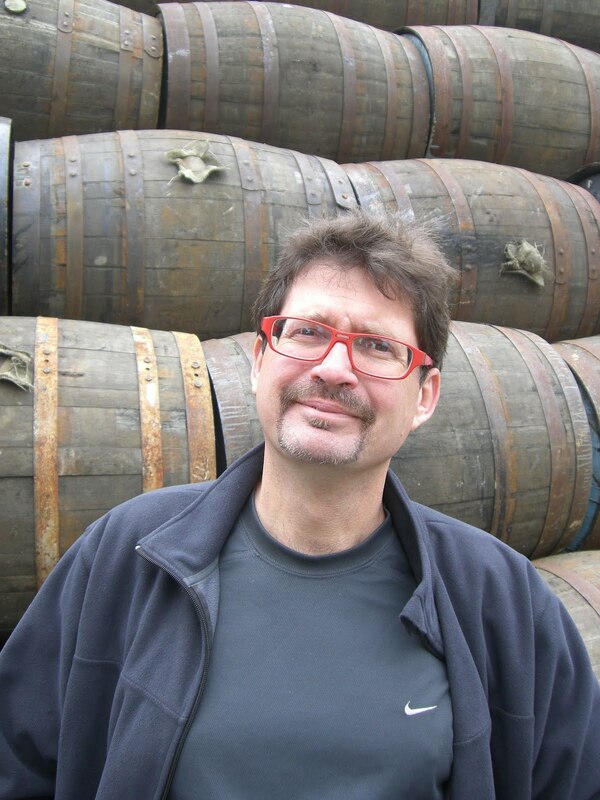 Blake, the tasting hugely affected my opinion of Chilean wine, these wines, and red blends. I have to admit that here-to-fore, I hadn't searched out any Chilean wines on my own, nor had I done this kind of focused tasting. I didn't realize that they're so well made, and so flavorful. I wouldn't hesitate to purchase a Chilean wine, now knowing that they're loaded with Bordeaux and Rhone cultivars. It was the Rhone's that blasted me away... honestly. 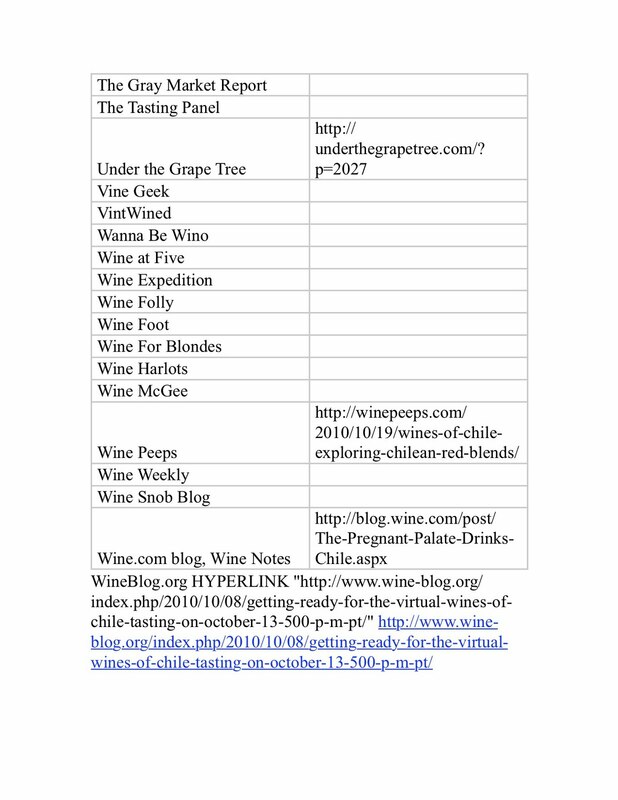 The tasting actually spurred a couple of articles on 1WineDude.com about pyrazine levels in Chilean wines - not likely what the wineries wanted, but some mention is better than no mention I suppose! I just googled "Hacienda Araucano Clos de Lolol". In the top 5 search results, 2 are contributions from me (the ***#1 slot*** is the review I submitted for that wine to PalatePress.com). I hopefully do NOT need to explain the importance of the first few entries for any search - much work has been done on that LONG before Google ever hit the scene (study of that phenomenon has been going on since the dumb-terminal days of airline result searches among travel agents). 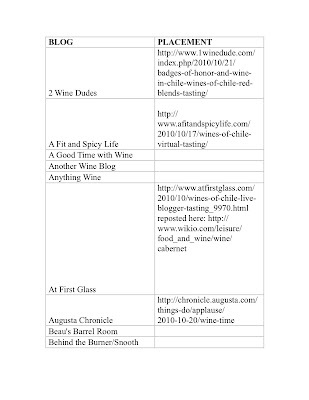 Where does the winery website end up in the search results list? I dunno, but I gave up after page FIVE of the results. Now, I'm not stroking my ego because if the above results had shown 3 of the top 5 to be GoodGrape.com or Vinography.com (as I originally had guessed, actually) I'd be making the same statements that follow. If I made wine and wanted to buy the #1 link on Google for my wine if I was a winemaker... I can't do that of course, but if it were possible... would it cost me more than shipping samples to 50 bloggers? There's no guarantee that can happen in every case, of course, or be positive if it did. I'm not sure why we keep drumming this topic up on the wine blog-o-sphere, actually. Clearly PR/marketing have found value in it in some way/shape/form, value beyond the cost of entry, so debating "if" is probably no longer relevant. Debating "how best" still *is* relevant. Certainly it was worth it...even if the bloggers were not targeted based on anything other than traffic levels. I'm guessing that 50 bottles is a pretty reasonable investment for a signioficant increase in brand surface area that has a long term exposure trail. I've been a proponent of Chilean wines due, to the QPR, since 1991 when I moved to VT, and had a blast rummaging through old country store wine sections, pulling dusty bottles from the early 1980's off the bottom shelves. Made out like a bandito. ...Blake, next time forward the wine, and I'll be glad to cover for you. 1) That somebody will search for one of these wines, other than for the purpose of arguing with me. 2) That Google search results will impress retailers, distributors or consumers. I searched for the wine Joe and Alder talked about and did not find it for sale in one single store in the United States. Maybe I'll check back in a month or so to see if some store carries it before the big holiday buying season. If you know of this wine going on sale somewhere, let me know. Blake, I'd caution that you not take the exact wine example too literally - the point is that this could be done for many wines; distribution being its own thorny issue notwithstanding, people ARE searching for wines online. Search results impressing anyone is not at all what I'm assuming. What I'm assuming is what's been strongly supported by scientific research - that people will pay the most attention to the first few search results returned for any given search that they perform on-line. 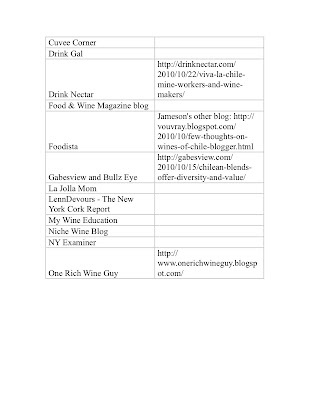 I think your comment on what wine bloggers say about wine is right on. Why be boring? 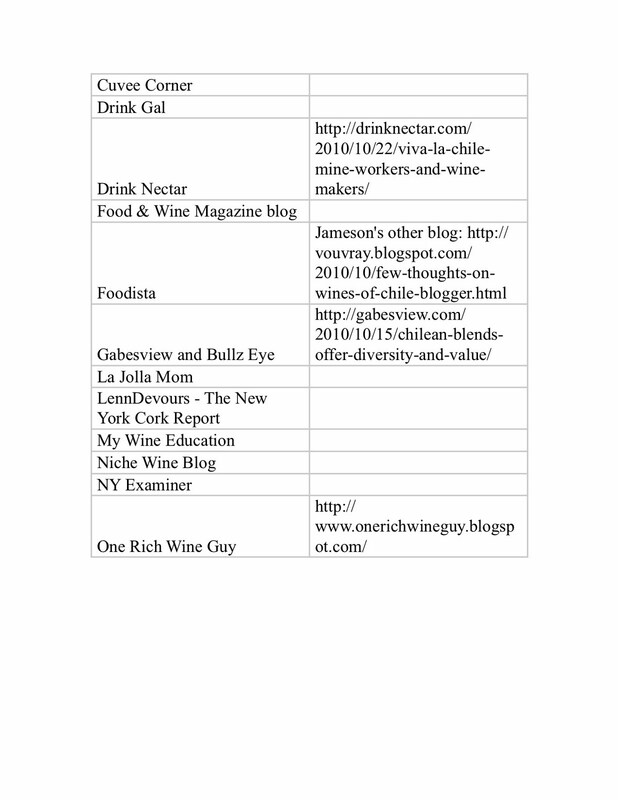 Most wine blogs that I read are the same and not very creative. Very interesting discussion, with lots of good points to consider. I agree with Alder that it's not so much about immediate results, but about getting the word out there. A lot went on during that tasting. Many of the bloggers organized groups to taste with them, thus expanding the number of enthusiasts trying these wines, many for the first time. And even when people don't write about a wine, they do talk. Then too, we all know the value of tasting a number of wines side by side. Many people took a new look at Chilean wine and that will make a lasting impression with respect to the industry as a whole. We're ALL still learning the value of social media, but just the fact that we're discussing it here means that SOMETHING is going right! Hey all - just heard from Alder (maybe he'll chime in here with more info.) that Google now localizes search results and bases them on past history, etc., for each user. So, the results will, literally, vary for just about everyone! I'm guessing that the on-line chatter is still better for getting a topic or a wine into those results, but there will be customization so my explanation above is only PARTLY accurate! I really like what Wines of Chile has done--I am not a wine blogger but read numerous wine blogs when I am trying to find new wines to serve at dinner parties and noticed that Chilean wines had been written up a lot. 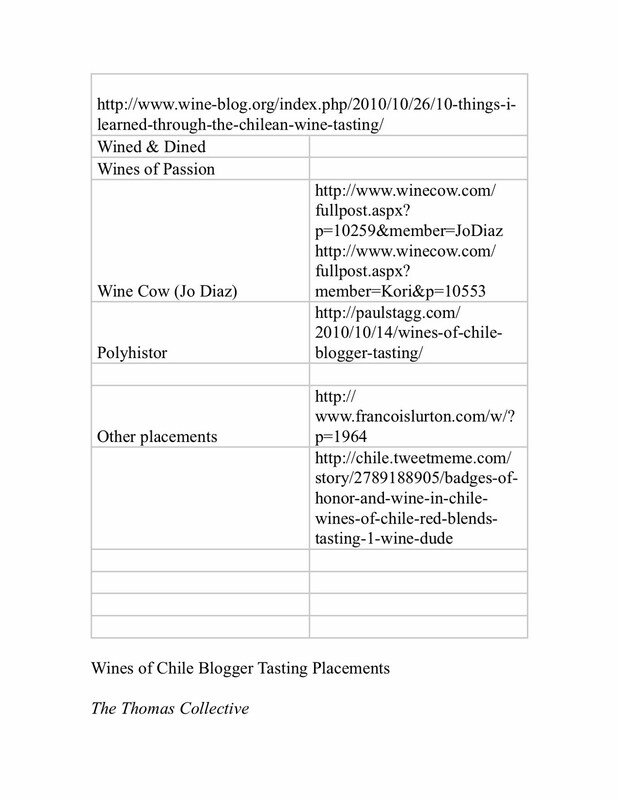 I realized this was due to an online tasting conducted with winemakers in Chile and thought it was a wonderful idea--I just wish I could participate, even though I don't have a blog! @Larry the Wine Guy - it was John Wanamaker (of Wanamaker's Department Store fame) that said "Half the money I spend on advertising is wasted; the trouble is I don't know which half." Excellent post,Thank you for providing this information. Keep Posting! !